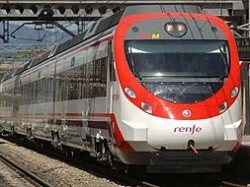 Trains will leave the terminus of the capital (Málaga Centro – Alameda) for hours 10, 30 and 50 minutes, while it will do Fuengirola o’clock, and 20 to 40 minutes. Thus, the daily supply of places in the line C-1 will increase by 48%. More than 8.7 million passengers used the service last year. From January to July this year, the demand has been of 5.317 million passengers, an increase of 9.5% over the same period last year. Renfe (Spanish railways) will put into service on Sunday September 11th a new frequency for the suburban line C-1 Malaga-Fuengirola, reducing the time between trains from 30 to 20 minutes. Thus, six trains will circulate hourly, three originating from Malaga and three from Fuengirola, which will increase the daily supply of seats by nearly 50 percent. The new frequency will not affect the travel time which is 46 minutes. If you are thinking about getting from Malaga airport to Marbella or Nerja we recommend to check prices for Malaga car hire, as trains will not get you that far.